This background comes in light of the revelations exposed by whistleblower Witness K and his lawyer Bernard Collaery that Australia bugged the conference room of then East Timor government. They now face criminal prosecution for revealing the Australian government’s illegal actions in bugging the private government discussions of our East Timor neighbours. On May 5, 1999 Indonesia, Portugal and the United Nations agreed on a UN-supervised “ballot consultation” process to determine whether the people of East Timor wanted independence. Indonesia agreed that if continued rule by Indonesia was rejected, they would quit the former Portuguese colony. However, despite initial optimism after the arrival of UN personnel, events unfolding in East Timor dimmed hopes of a free and fair referendum on independence for the nation. The Indonesian military and militia groups deliberately intensified moves to foster an atmosphere of terror and intimidation in the run-up to the referendum. Over a period of two months leading up to ballot paramilitary militias backed by the Indonesian armed forces killed more than 150 people, with many more missing. In the East Timorese capital of Dili, militia groups with overt support from Indonesian soldiers attacked many pro-independence supporters and drove thousands of people from their homes into makeshift reservations, described by human rights groups as similar to concentration camps. At the time, the application of former Australian Foreign Minister Gareth Evans for the position of UNESCO Director-General was supported by the Australian Liberal Party and its Foreign Minister Alexander Downer. Evans, a long-time defender of the Indonesian regime, once described the execution of some 270 people during the 1991 Dili massacre as an “aberration”. Evans also negotiated the Timor Gap Treaty between Australia and Indonesia, a treaty which neatly excluded the East Timorese from any share in the exploitation of the oil resources which lie beneath the sea bed around East Timor. Evans was noted for his attacks on supporters of human rights for the East Timorese as being unrealistic and ignorant of Indonesian “realpolitik”. In 1999 in the United States the State Department and Pentagon reported projected arms sales for 1999 to Indonesian military of $106 million, as well as plans to train the Indonesian police. From the earliest days of its formation in 2002 as an independent state with a government led by Fretilin, Australian governments have been seeking ways to undermine the government of East Timor. Its aim: to replace it with one that would comply with Australian policies and do Australia’s bidding. The establishment of a military base under the control of Australian forces and available inevitably for use by the United States forces as a forward base for US troops, tanks, aircraft, missiles and warships, has always been a major objective. In 2006 the Sydney Morning Herald reported that an Australian base was to be established in East Timor and that the Australian government had already tendered for the construction of the base. It would house 3,000 troops and be equipped with all mod cons. The report said that the base would be maintained for 15 months but it is unlikely that such a substantial base would be established for such a short space of time. The push for a base has to be seen on the background of the general situation in the Asia-Pacific region. Its intended use was not only to be to impose and maintain a colonialist regime in East Timor but also aimed against Indonesia and the Asian mainland. The Australian and US governments were preparing, step by step, for a big war in Asia within the next 15-20 years or less. In October 2005 former military adviser to the Howard government Ross Babbage published a booklet “Preparing Australia’s Defence for 2020”. He wrote of the possibility of a “major war in Asia in the 2020 timeframe”. A forward base in East Timor fits snuggly into this plan. However, the emergence of a Fretilin government with Alkatiri as Prime Minister, to whom independence meant real independence and not some new form of colonisation, threatened, and still does, these ambitions. The Fretilin government proceeded to implement social and economic policies without resort to the shackling loans, “market forces” economics and privatisation policies of the IMF and World Bank. Furthermore, Prime Minister Alkatiri stood up to the bullying and threats of Australia’s Foreign Minister Alexander Downer over the control and revenue sharing of East Timor’s oil and gas resources. 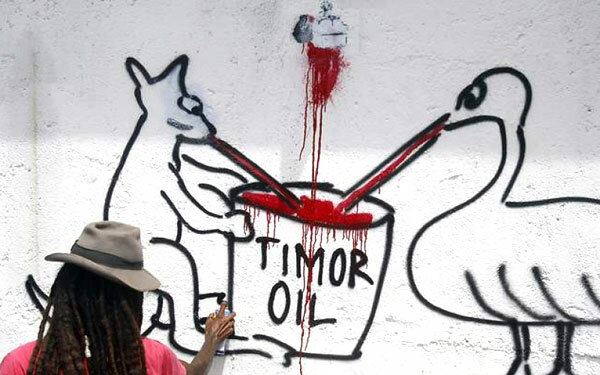 In a situation when control of oil and gas supplies, exploration and pipelines has become a major international issue and when the former, almost completely control by US and British companies, is being challenged, control of East Timor’s considerable oil and gas resources was a significant issue. Indonesian and East Timor oil and natural gas supplies may become a critical source of supply to Australia and the United States in the future. These are all major reasons behind the Australian government’s determination to remove Mari Alkatiri as Prime Minister and to destroy Fretilin as the major progressive and government force in East Timor’s political life. The first signs of this conspiracy against East Timor were evident when the US and Australia urged the scaling down of the UN mission in East Timor following the vote of independence and the election of the Fretilin government. Once the UN was removed as an effective presence the way was cleared for other preparations to be put in train. The main objectives were the removal of Mari Alkatiri as Prime Minister, the weakening of Fretilin as the majority Party and its eventual replacement by other political forces and leaders who will be amendable to the political and economic policies favoured by the Australian government. This coincided with the long-term objective of Australian governments, including the current one, and was behind the use of Australian troops at the time of East Timor’s independence in 2001. It appeared at the time that the Howard government had, all of a sudden, become genuinely committed to the independence struggle of the savagely suppressed population of East Timor. But this conversion was never the truth of the matter. A task given to the Australian military forces set down in the Rules of Engagement agreed between Australia and the East Timor government, was to disarm the soldiers who had rebelled against the army and police forces loyal to the government. However, immediately upon the arrival of the Australian forces, officers hot-footed it into the hills where the mutinous soldiers were located, not to disarm them, as had been agreed in the rules of engagement but to talk and no doubt drink the beer that Major Reinado had suggested they bring with them. As far back as 1999 this paper wrote of “Australia’s imperialist ambitions cloaked in humanitarian pretences”. The government had announced what was called the “Howard Doctrine” at the time. It made clear the Australian government’s intention to play a “Deputy Sheriff” role to the United States. The same advance preparations were made for intervention this year. Once again the real intentions are being obscured by humanitarian pretences. If Australia’s real intentions are successful it will be a tragedy for the East Timorese people who will again be reduced to a colony not of Indonesia but of Australia. Unfortunately, some who played a worthy part in the struggle for independence from Indonesia are now, as a result of confusion, blindness or malice, about to sell their country’s independence to the new colonial power in the South Pacific.